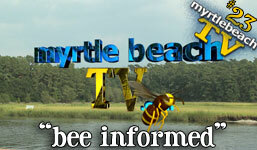 First airing on FOX Myrtle Beach / Florence on Friday, November 2, 2007, episode 23 of the myrtle beach TV series entitled, "Bee Informed" takes viewers from Little River to CCU in Conway to Murrells Inlet. We talk with locals about a variety of things, at the Little River Chamber business after hours party at Sandhills Bank, at the North Myrtle Beach Chamber's Endless Summer Festival, and with AJ Case and Sean McKenna at AJ's CD release party at The Venue in North Myrtle Beach. Scott Perez again talks with Senator Ray Cleary, Bill McKown, and Tom Herron at Spud's in Murrells Inlet. Watch episode 23, "Bee Informed", in its original HD format, by clicking here, or by clicking on the photo above.